The tests themselves are a good way to test that your cluster configuration is correct and complete, so what does each one of the tests do? The results of the test is passed through to the UI to help identify potential mis-configuration issues if the test fails to complete, in order for the result to be passed through as a pass, all hosts must return a success. 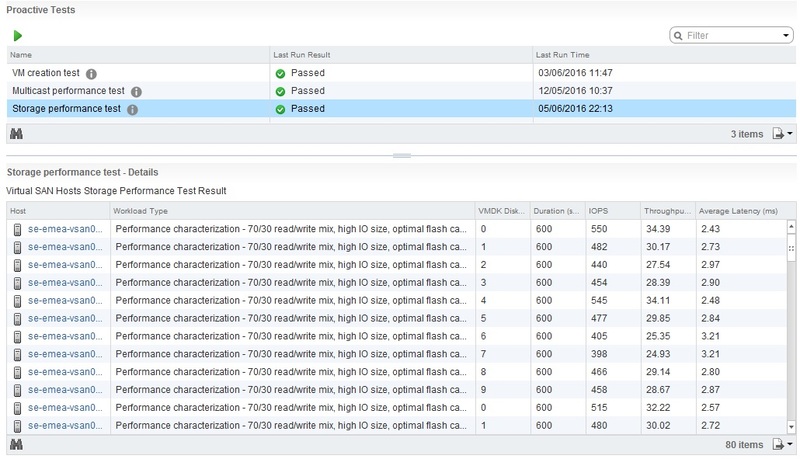 Like the VM Creation test, the results are passed through to the UI depending on the above success criteria.? This allows you to check that your network supports multicast as well as the performance of multicast on the physical network. I personally like playing around with this one in my all-flash lab with different RAID levels and different performance profiles, I also use this a lot with customers just after they have set up their environment for a proof of concept, it allows you to get a baseline of performance for the cluster and troubleshoot any mis-configuration prior to running the proof of concept that could affect the performance. So apart from being able to choose how long to run the test for and the storage policy used for the test, what about the workload itself?? Well in the workload there are a number of tests that you can perform, there are enough tests to be able to generate a workload to simulate most real world workloads out there today, under the tests I have performed, it is pretty clear that the Storage Performance test here is pretty I/O intensive and after running the tests a few times it was clear that the tests also use 4K block sizes.? So what are the options in the Workload types? Customers always ask me how realistic these tests are, I have done some comparisons with HCIBench also, and so have some of my customers, and HCIBench produces the same results, so as you can see the Virtual SAN Proactive Tests can save you a lot of time and effort with regards to things like storage performance testing, and remember they are very I/O intensive, coupled with the new performance monitoring charts in Virtual SAN, you have more tools at your fingertips all within a single user interface. Is running these tests advisable in a production environment? If so, any caveats? Thanks! We have an 8-Node cluster with 4 Disk Groups per node–each group consisting of a 745 Cache SSD and three 1 TB Capacity Spinning disks (hybrid VSAN). Each hosts has two controllers–and each controller manages two disk groups. I have run the Stress Test several times and each time one (sometimes two) of the hosts will fail the test. It seems to be different hosts each time. The Low Stress Test and the Basic Sanity tests pass with flying colors. 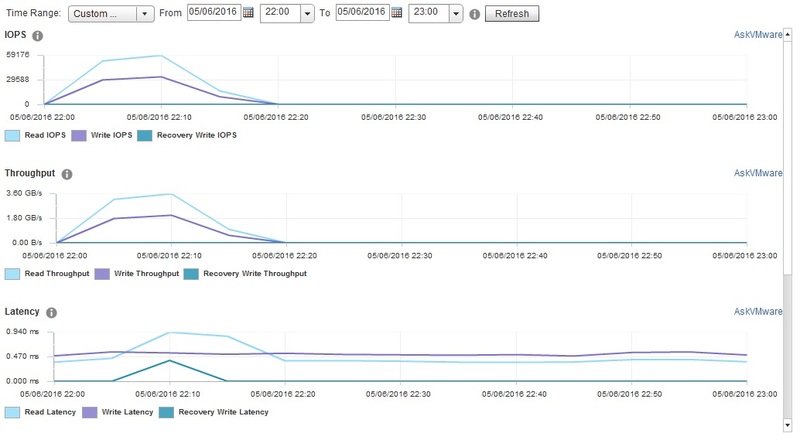 Obviously–I would like to determine why it is failing the Stress Test and resolve the issue BEFORE actually moving data onto this VSAN and starting to use it in production. I am wondering if you have any insight and can provide any suggested course of action in pursuing and resolving it. One thought I had (that has not been substantiated but is just a thought) is that when the VSAN was created even though I picked “Manual” disk group creation the system automatically picked what disks belong to what disk group. So it is conceivable that the cache disk and capacity disks in each disk group might be controlled by different controllers. I know which drives are connected to which controllers so I should be able to go back and verify this. Do you think if a disk group is made up of disks that are spread across different controllers that might impact performance in the stress test? I was having the same issue, for me it was because my storage policy had 100% for reservation, changed it to 0% and now the test are working fine.